While Gotham usually has a bunch of different story lines going at the same time, this episode only had two. 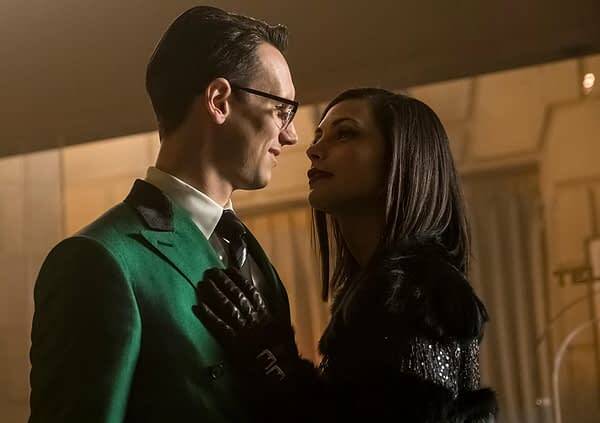 Lea (Morena Baccarin) and Riddler (Cory Michael Smith) robbing banks and the return of Ra’s al Ghul (Alexander Siddig). Though the stories were intermixed in the episode, I’ll separate them out here for clarity. Starting with Ra’s. Last we saw Barbara (Erin Richards) had the Demon’s Head and the female members from the League of Shadows. Tabitha (Jessica Lucas) was taken by the male contingent and she in turns gets Selina (Camren Bicondova) to bring Bruce (David Mazouz) to come help her. It’s a trick and they use Bruce’s blood to bring Ra’s back to life. Seems Barbara isn’t accessing the full abilities of the Demon’s Head, even when her group tries to attack her to make the powers kick in. So Ra’s decides to take it back and confronts her. She escapes with the help of her warriors and her friends. Joined by Alfred (Sean Pertwee), they figure out they need to get the dagger again to kill Ra’s. The dagger they gave to the Nanda Parbat embassy, so Alfred and Tabitha go in and make a scene while Selina sneaks in and steals it. Though Bruce is certain only he can kill Ra’s, Selina gives the dagger to Barbara. She has a showdown with Ra’s and must face him alone, it isn’t going well and the dagger does nothing when she stabs him. Bruce tries to help, but isn’t allowed to. When Ra’s stabs her with the dagger, it triggers the powers and she is able to see the future enough to prevent dying and beat Ra’s. Except he grabs Tabitha and kills her, again as Barbara sees in the future, so Barbara willingly gives Ra’s the power back to save her friend. Ra’s fully regenerates and breaks the dagger, saying its not time for him to die. Barbara thinks that it’s all over and she’s just a night club owner again with her friend Tabitha… then the women of the League arrive, saying that they see Barbara as a true leader and swear allegiance to her. So she doesn’t have the power, but she has the ninjas. The second story is Lea and Riddler doing the Bonnie and Clyde thing, robbing five banks in one night. Gordon (Ben McKenzie) figures it’s the Riddler and goes to see Lea but she won’t give Ed up. Gordon still loves her. All of the money was giving to the people of the Narrows, a sort of Robin Hood thing. But it catches the attention of Penguin (Robin Lord Taylor) and his enforcer Grundy (Drew Powell) who show up to demand half. When Lea sends them away, Penguin tells Ed that Lea is just using him, playing on his emotions. Riddler knows this and goes to see Penguin later, making plans to bring them in on the bigger heist that night. Gordon realizes that all of the places hit were some the same bank and finds out that they’ve moved all of their assets to one secure location. Lea and Riddler break into that secure location, take out the guards with sleeping darts and that’s when Penguin and Grundy show up, and Ed’s betrayal is revealed… except it isn’t. Ed needed Grundy to open the vault and he knew that Penguin would plan to rob them after they pulled the job, so he invited them in and the locked them in the vault with all the money gone. Ed/Riddler is in love with Lea and Lea seems to be falling for Ed. 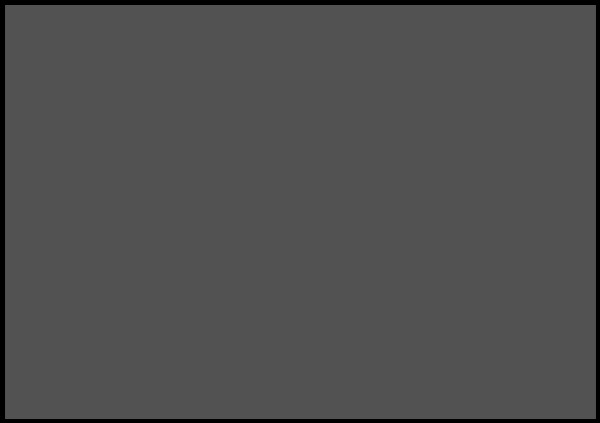 The cops arrive before they can get away, so Lea goes out the front to distract them, knowing seeing her would throw off Gordon and Bullock (Donal Logue) while Riddler heads out the back and gets away with the money. It works, Lea is arrested. The episode ends with Ra’s showing up at Wayne Manor and explaining to Bruce and Selina why he’s chosen to stay alive. He saw something climactic coming, something that will be a forge for a new Gotham and will make Bruce into the Dark Knight he is supposed to become… if he survives. He seems to think its his job to guide Bruce. Where the frantic nature of Gotham is usually fun, I enjoyed having just the two main stories to follow. Still not quite sure what they’re doing with Barbara and where the character is going to end up, but she is very interesting. I think the next two episodes will be similar as in following out some plot lines before whatever apocalyptic thing they have planed for the finale. Gotham is taking next week off before returning for the start of the final three episodes of the season. Rumor is that it’s going to end with a huge shake up, a la ‘No Man’s Land‘ from the comics, that will be a soft reboot for the series going into season five… if there is one. And it looks like Jeremiah (Cameron Monaghan) is back next week and his assistant is wearing a harlequinn costume.